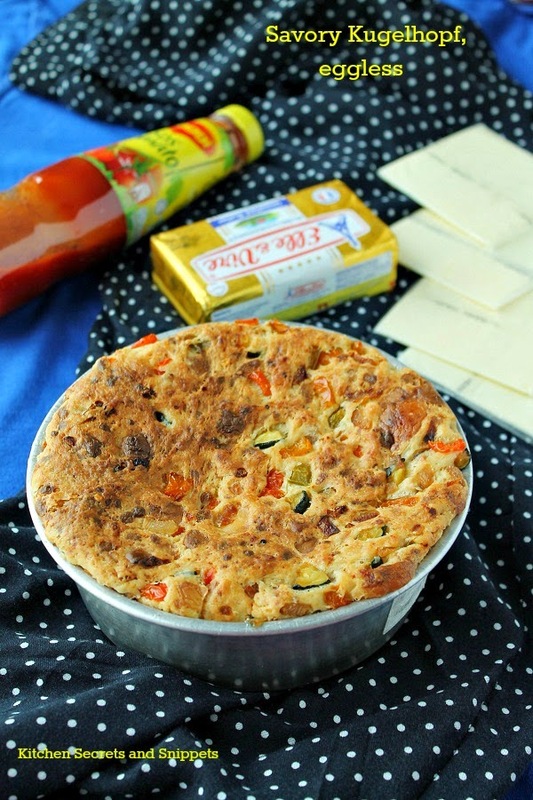 As a part of our event IFC, International Food Challenge, this is the second entry for the challenege given for Alsace Lorraine region of cuisine. Hope many of our member's would have enjoyed this recipe and also we've received lot's of good feedback for this entry in specific. We, ofcourse, are very glad that u guys enjoy our challenge and we also take a little pride in trying many unknown recipes from around the world. Let's get going to the recipe..
2. Instant yeast 1 tsp. 3. Warm Milk 6 tbsp. 5. Unsalted Butter softened 2 ½ tbsp. To the mixing bowl add the 1 cup of flour, salt, sugar and the softened butter. 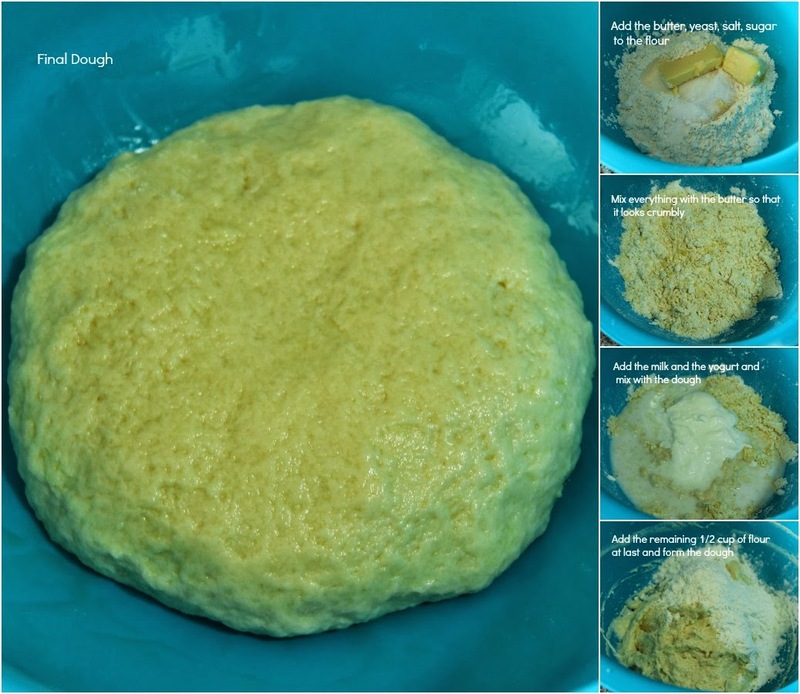 Mix the flour with the butter so that the mixture looks crumbly. Later add in the warm milk and the whisked curd to the flour and start mixing, now the dough will be very much sticky. Add the oil and combine with them thoroughly. Later add in the remaining flour and mix well with the dough. Knead the dough for 4 to 5 minutes if using ur hand, else 2 minutes on the mixer to form a shiny and a smooth dough. Cover and keep it in a warm place for an hour to let them raise double in size. Mine took 1 hour exactly. Meanwhile work on the filling. In a tsp of oil, sauté the onions with a pinch of salt until it sweats and caramelized, remove them and set aside in a bowl. Next sauté the tomato just for few secs and remove them to the bowl. Throw in the chopped bell pepper with the red chilli flakes, salt and cook them for a couple of minutes so that it remains crisp. Finally add in the zucchini with little bit of salt and cook until it is half way cooked. Transfer everything to the bowl and add the ground pepper powder, salt, only if needed, the cheese and the herb seasoning. Combine well and set aside. Once the dough has raisen, punch them through and let al the air out. Roll them to form a rectangle and spread the veggie filling evenly over the top. Roll them from the top to form a log. Now place the log in the greased bundt pan along the sides / just place them in a pan just I did, and keep in a warm place for the second rise fpr 30 minutes. Preheat the oven to 200 deg C for 5 minutes. Place the second risen dough and bake for 30 minutes. Tastes good as it is, no need for any side. 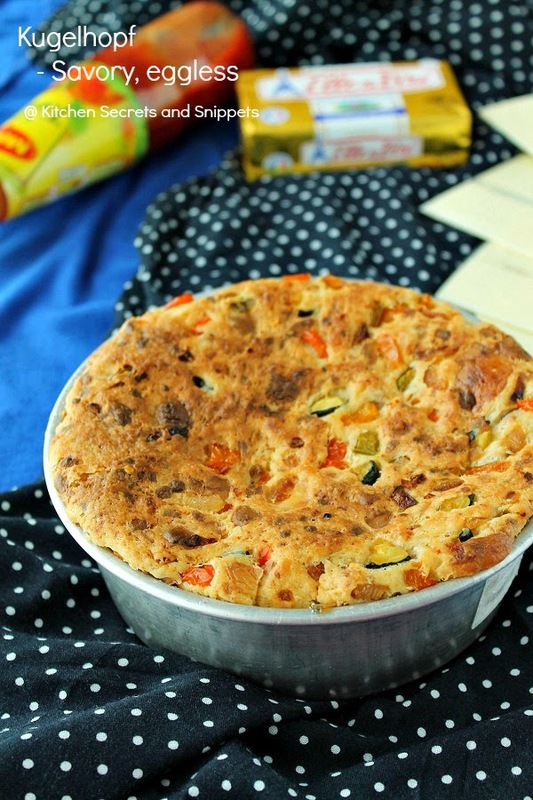 Savoury kugelhopf looks extremely delicious, prefectly baked eggless kugelhopf..